the lyrics pierced their hearts. wind and call of chuk-chu-ri-kur . A disturbance in tyrants’ ears. * The first known Mizo poet. She was buried alive supposedly for going on composing songs. The place where the spirits of dead people were believed to go. ‘Heroes’ who had slain many enemies and animals were supposed to receive a special treatment there. Wood nymphs who helped men they fell in love with to shoot many animals. A plant used for healing wounds. Malsawmi Jacob is among our foremost Mizo writers in English and her work has been featured on the blog a number of times over the years. 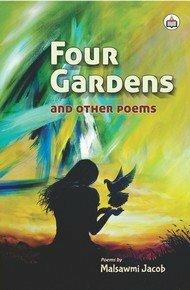 These poems are from her recently published book of poetry titled Four Gardens and Other Poems available on amazon.com. The collection is divided into seven thematic sections and the three pieces selected here are from the section entitled Roots, dealing with her ethnic identity and cultural origins. “Jana Gana Mana”at the top of my voice. as the beat of my heart during job interviews. India has celebrated its Independence day. the first time they learnt to type on a computer keyboard. to my colour blind eyes. Lalsangliani Ralte speaks for every Mizo, and possibly every Northeast Indian, in this poem about linguistic and socio-cultural differences, while at the same time affirming allegiance and loyalty to the mother country. I have deliberately chosen to post this on the 71st anniversary of India's Independence Day. Thank you, Sangliani, for being our voice.